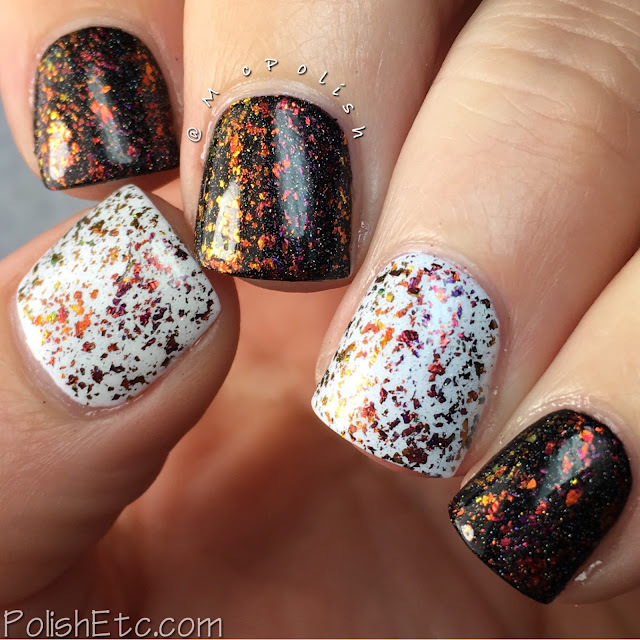 Top Shelf Lacquer - Holiday Flake Out Collection - Polish Etc. Today, I have a fun flakie collection from a fairly new to me brand. I first got acquainted with Top Shelf Lacquer at PolishCon. Not only do they have wonderful polishes but also very nice bath and body products. I love the soap! For the holidays, Top Shelf Lacquer has created a collection a delicious ultrachrome flakie polishes. There are 12 shades in this collection, 8 jellies and 4 toppers. They all look different from each other and the jellies shades look amazing. 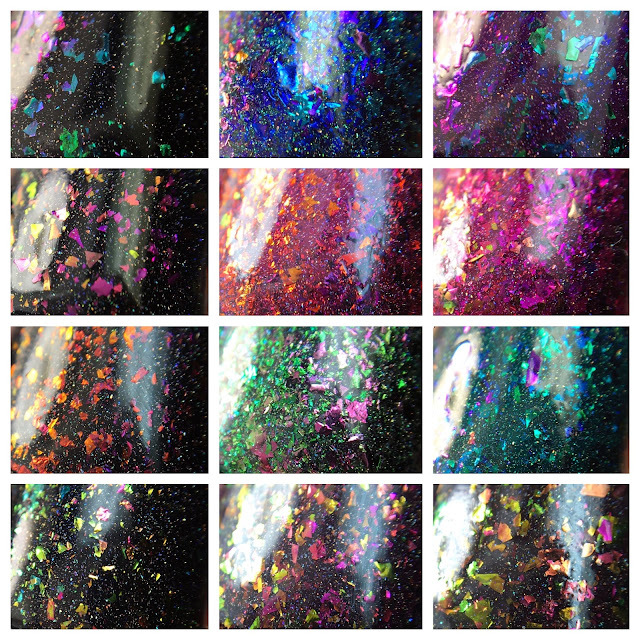 So capture all of the shifty goodness of these flakies, I took my swatch photos using two different light sources. I have them at opposing angles to help show off the shifting colors in one shot. I hope you like them! Click through for lots of shifty pics! Snowball Cocktail - A clear based polish with fine holographic shimmer and metallic ultrachrome flakies that shift from fuchsia to purple to blue to teal. I used this as a topper over white and black but you could sponge this on to get full opacity. Personally, I love to wear flakies like this over the bare nail. You should try it! Winter Ruby - A clear based polish with fine holographic shimmer and metallic ultrachrome flakies that shift from green to gold to orange to fuchsia. I am showing you one coat over black and white with a glossy top coat. Again, you could get this opaque on it's own with the sponging method or wear it alone over the bare nail. Candy Cane Martini - A clear based polish with fine holographic shimmer and metallic ultrachrome flakies that shift from yellow to orange to red/purple. I am showing you one coat over black and white with a glossy top coat. Again, you could get this opaque on it's own with the sponging method or wear it alone over the bare nail. Happy Elf - A clear based polish with fine holographic shimmer and metallic ultrachrome flakies that shift from yellow to green to orange. I am showing you one coat over black and white with a glossy top coat. Again, you could get this opaque on it's own with the sponging method or wear it alone over the bare nail. Blue Coconut Cocktail - A teal jelly base with fine holographic shimmer and metallic ultrachrome flakies that shift from green to blue to purple. This combo of colors is so lovely. I used three coats with a glossy top coat for these photos. The Grinch - A grayed out green jelly base packed with metallic ultrachrome flakies that mainly green with pops of pink aqua. This shade seems much more metallic and flakie filled than the rest. For these photos, I have on three coats with a glossy top coat. Santa-tini - A red jelly base with fine holographic shimmer and metallic ultrachrome flakies that shift from orange to pink to purple. I think this shade looks like burning embers on the nails. This is three coats with a glossy top coat. Cranberry Moscow Mule - A warm pink jelly base filled with fine holographic shimmer and metallic ultracrhome falkies that shift from green to gold to pink. This shade is definitely the most girly of the bunch. I am showing you three coats with a glossy top coat. Mulled Wine - A deep purple jelly base packed with metallic ultrachrome flakies in blue, teal and purple and a splash of fine holographic shimmer. The base of this shade was more opaque and I only needed two coats for full opacity. Love this color! Blue Bell Cocktail - A blue jelly base with holographic shimmer and metallic ultrachrome flakies that shift from red/gold to blue. The gold/red shift against the blue background is very nice in this polish. It was most sheer of the jellies. I am showing you three coats with a glossy top coat. Chocolate Raspberry Martini - A dark brown jelly base filled with fine holographic shimmer and metallic ultrachrome flakies that shift from green to gold to pink. The base color pretty much looks black to me, but softer than just stark black. I only needed two coats for full opacity here. Fireside Delight - A black jelly base with fine holographic shimmer and packed with metallic ultrachrome flakies that shift from green to gold to orange to red. I think this polish has the largest flakies of the bunch. I am showing you two coats with a glossy top coat here. So many flakies!! I really like the jellies in this collection as the topper are not super unique to my collection. My favorites are Mulled Wine and The Grinch. Which are your faves? These are available now from Top Shelf Lacquer. They offer both full sizes and half sized bottles. The full sized bottles are $12 for 15ml and the smaller sized bottles are $8.50 for 8ml. You also have the option to purchase the entire collection for a discount through December 14th. The full sized collection is $124 and the small sized collection is $90.